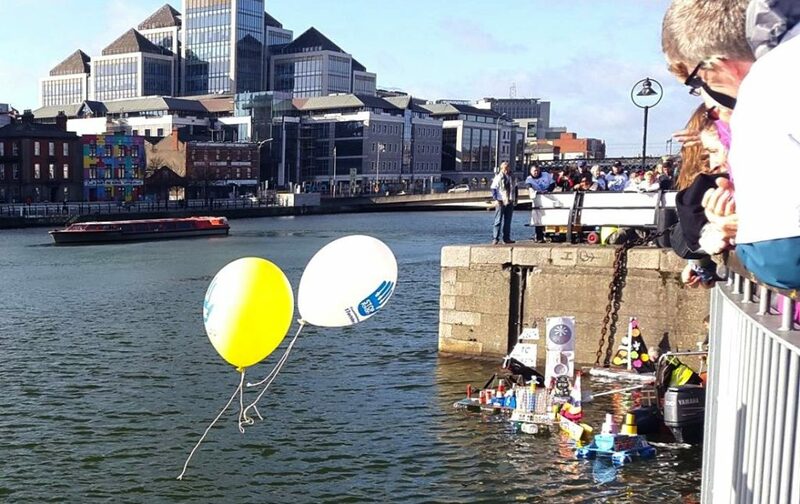 The Global Goals Boats on the Liffey! 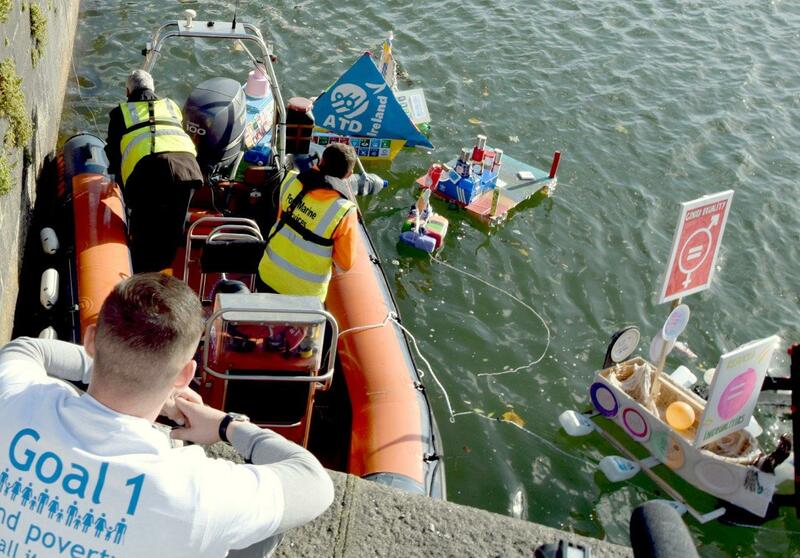 To mark the 30th Anniversary of the UN End Poverty Day and to contribute for the civil society mobilisation for the UN 2030 Agenda, the INTO Global Citizenship Schools Network and the Irish 17 October Committee invited schools and other groups of children, young people and adults around the Country to create boats of hope to be launched on the River Liffey on 17 October as the finale for national commemoration of the UN Day. 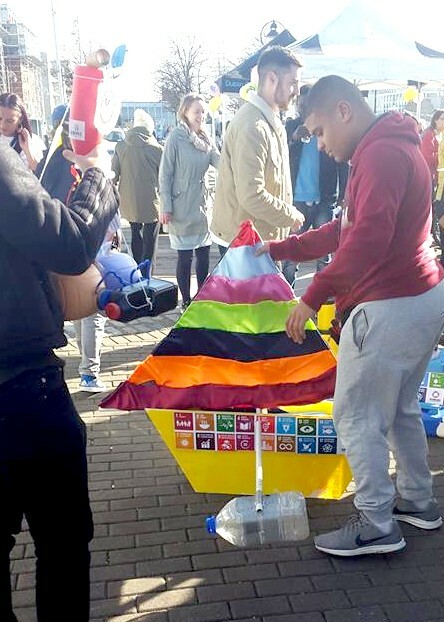 In total 17 schools and other groups of children, young people and adults prepared 17 Boats, symbolising the hopes generated by 17 Global Goals. 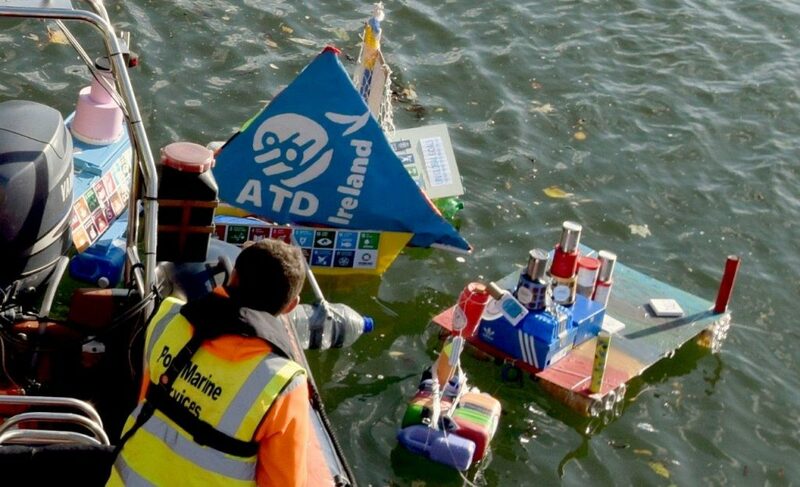 The boats were made out of recyclable material and easy to transport and of course, able to float! 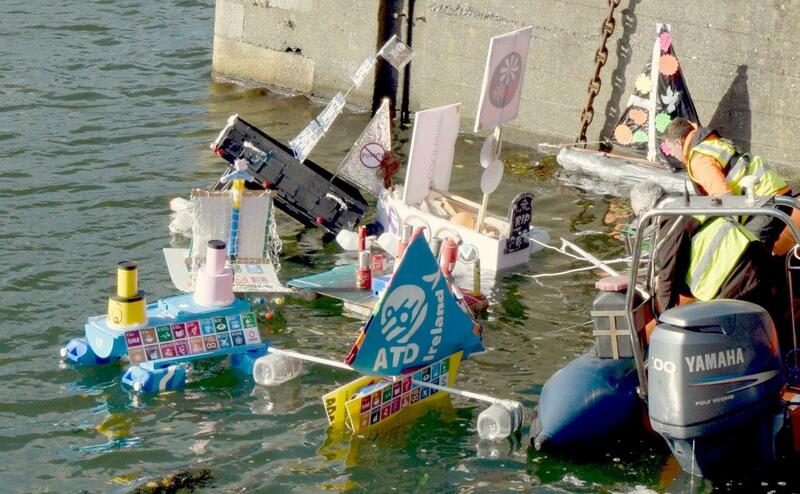 Each boat carried messages of hope from people attending the event. 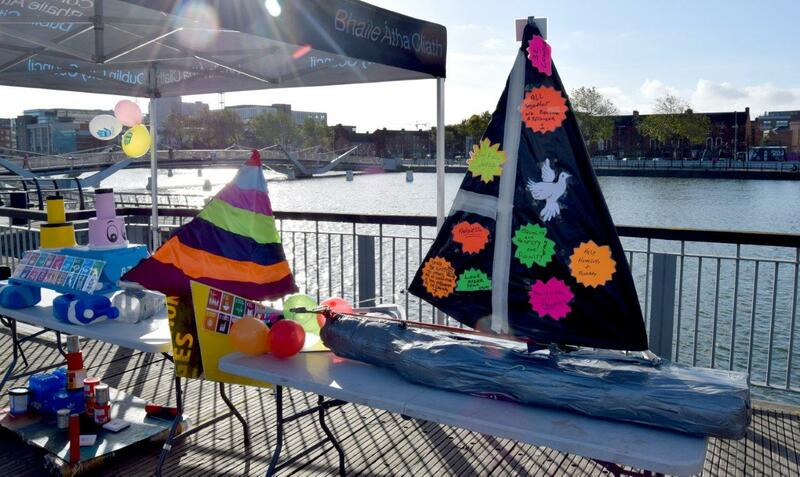 Unfortunately, in the aftermath of the hurricane Ophelia, only one school out of 7 who had prepared boats was able to attend the event on the Tuesday 17th October (School had been officially closed for the day). 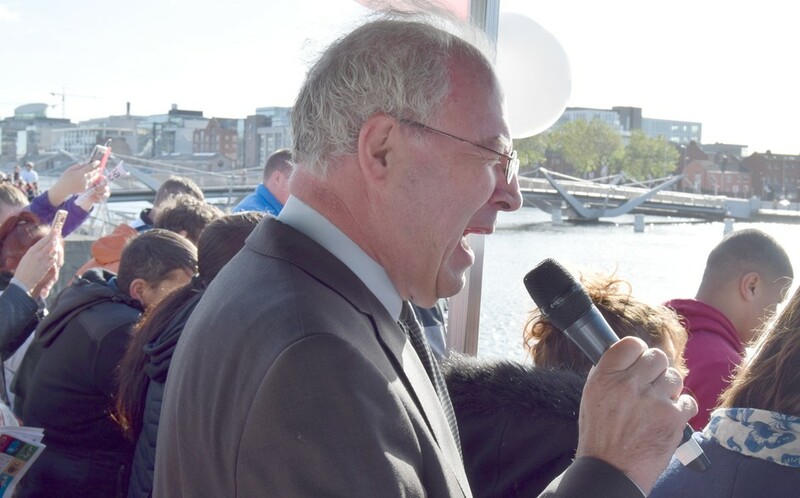 The launch took place as planned referring to the work of these schools around the country. 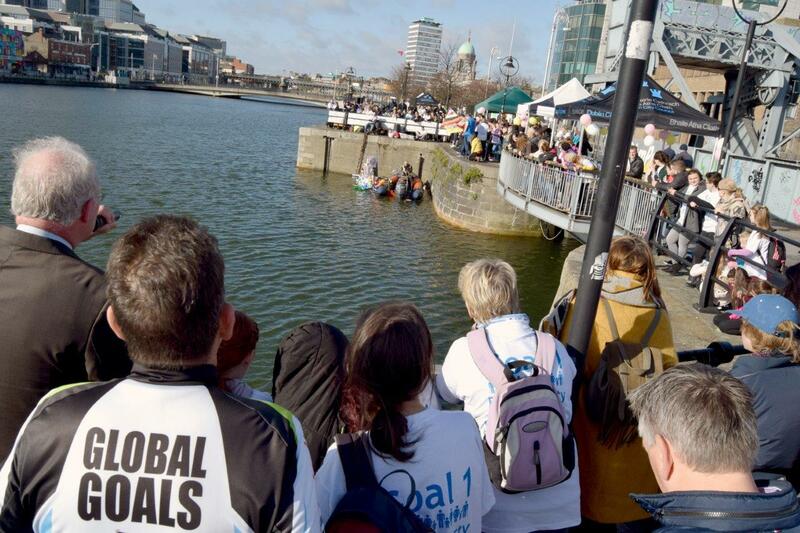 The boats launched into the Liffey symbolised the expression of our hopes and commitments to end poverty, fight inequality and act on climat change, the 3 main challenges of the 17 Global Goals. Lucy and James – We wish to speak on behalf of the schools who could not get here today to launch their global goal boats of hope and express their own hopes for a better and fairer world for everyone. 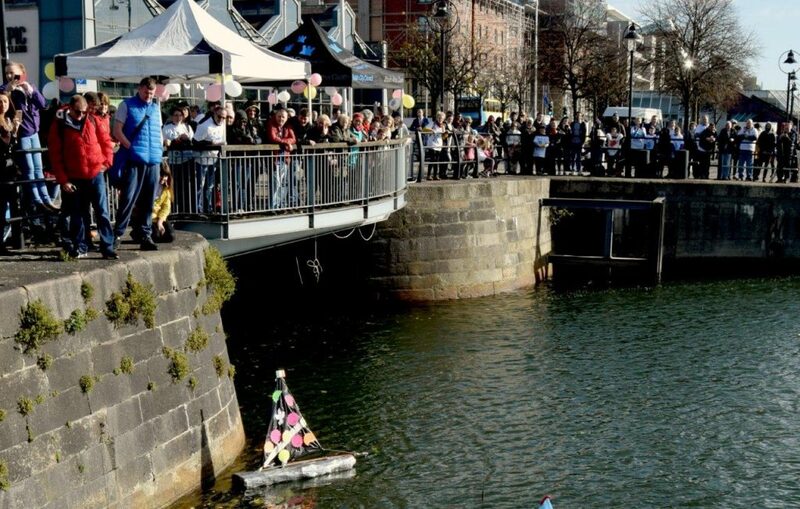 The schools who wanted to but could not come today include: Castlemartyre National School Co.Cork, Newtown White Kilsallagh Co.Mayo, Greencastle National School Co.Donegal, Carnaross National School Kells Co.Meath, Balbriggan and Tyrrelstown, ET National Schools Co.Dublin, Mater Hospital Primary School Dublin. They hope that this event is a success and that the rest of the world can play their part in making the world a fairer place for everyone. Did you know that even a small amount of money spent on weapons and nuclear bombs could eradicate poverty on our planet? Thank you. Philip – Good morning, thanks for coming out this morning, I’m from the North West Inner City Training and Development Programme. 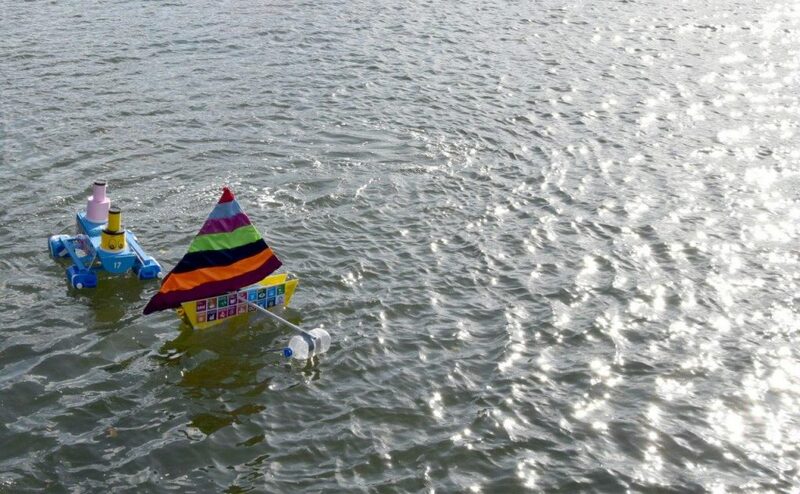 We tried everything with our boat, submarines, everything we tired so we just wrapped something up in plastic and hopefully it floats. My hope for today was after last night for a bit of that stuff up in the sky today. 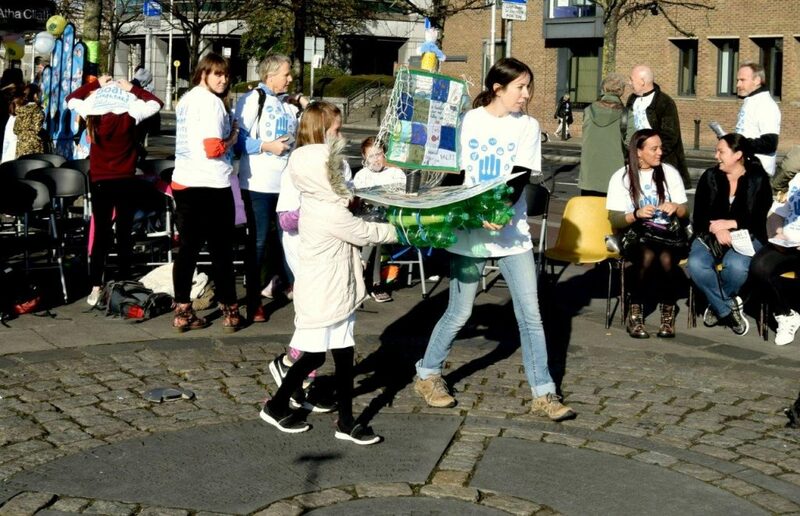 Anne – Misean Cara is a faith lead missionary movement a global movement supported by Irish Aid, we believe that there are pathways out of poverty! 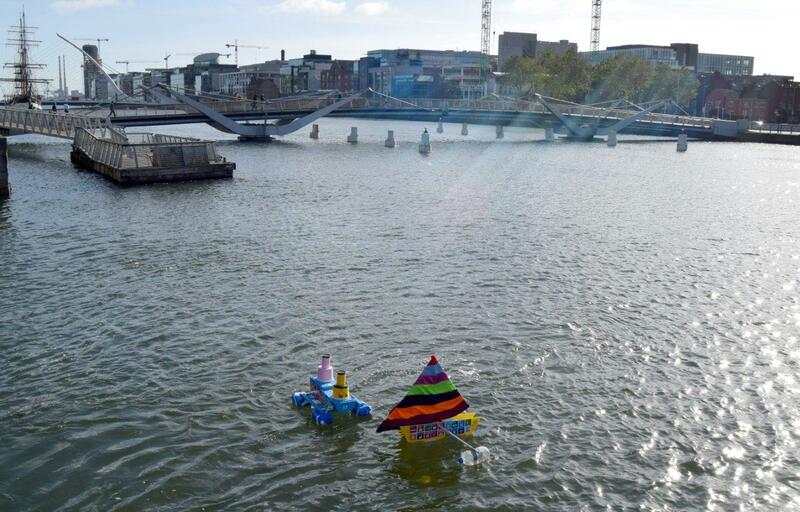 Children – We are from Rush and Lusk Educate Together and we have been working really hard to build our boat. 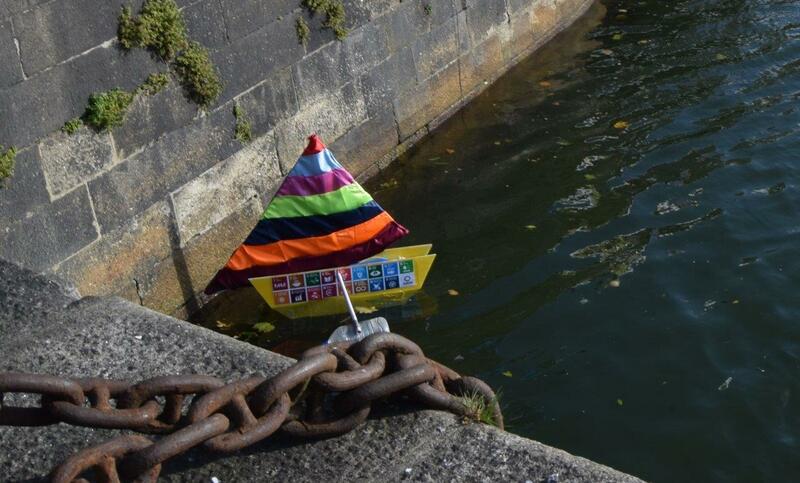 Our boat represents Goal 6 clean water and sanitation and Goal 14, life under water. All our class have written down their hopes and wises on patches and we have sown them together to make a sail. We hope to spread our hopes far and wide to make this a reality. 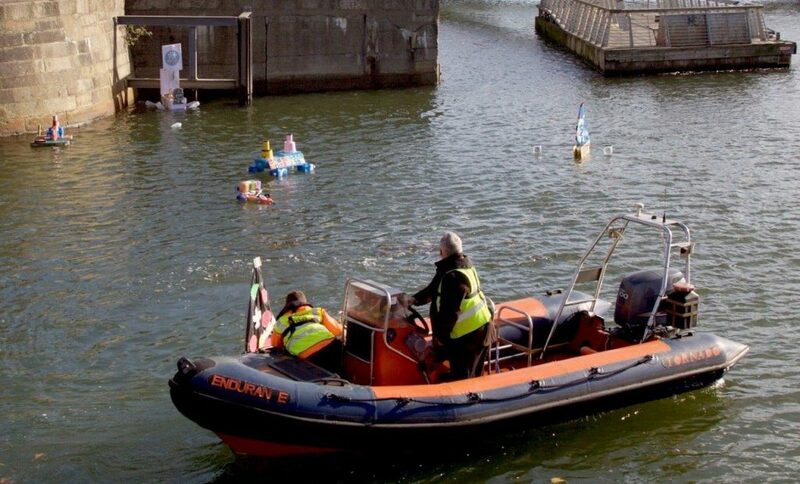 Marie-Ange – Our boat is a family enterprise! It’s about life under water, life started under water and everybody needs water. It gives food and employment to millions. 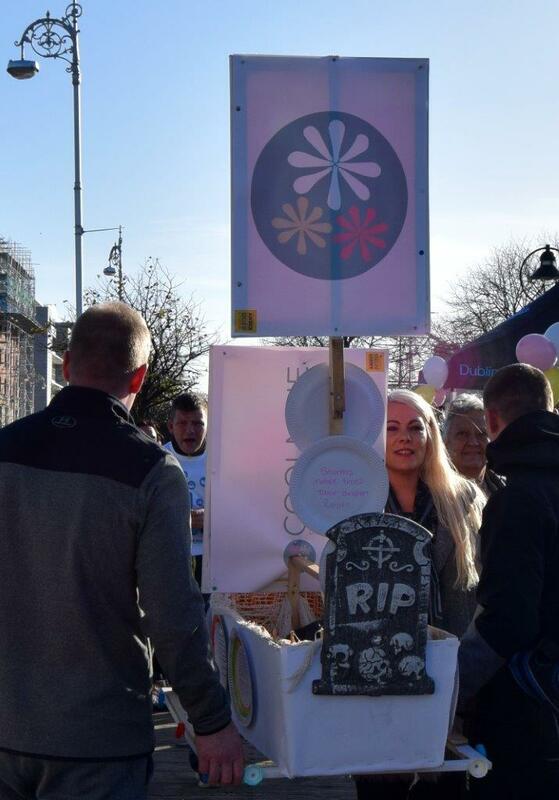 Mark – I’m a recovering drug addict and I’m here with the Coolmine house project. 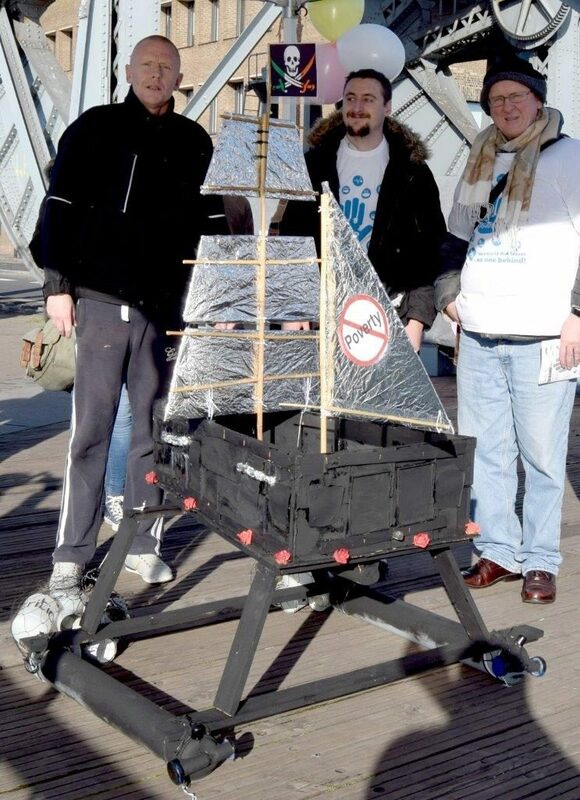 Our boat represents poverty. There’s a lot of support here today and there’s a lot of hope and there’s a lot of places in the city that are here to help drug addicts and people in recovery. 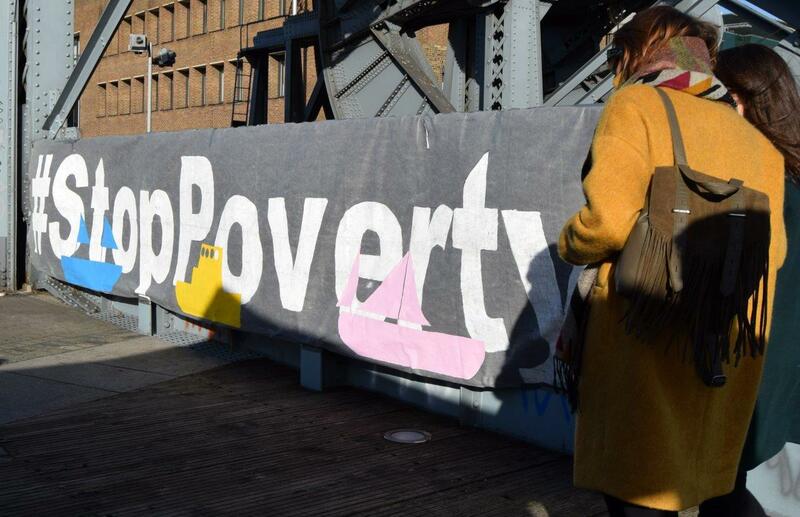 Val – Poverty is like an epidemic affecting every corner of the world. 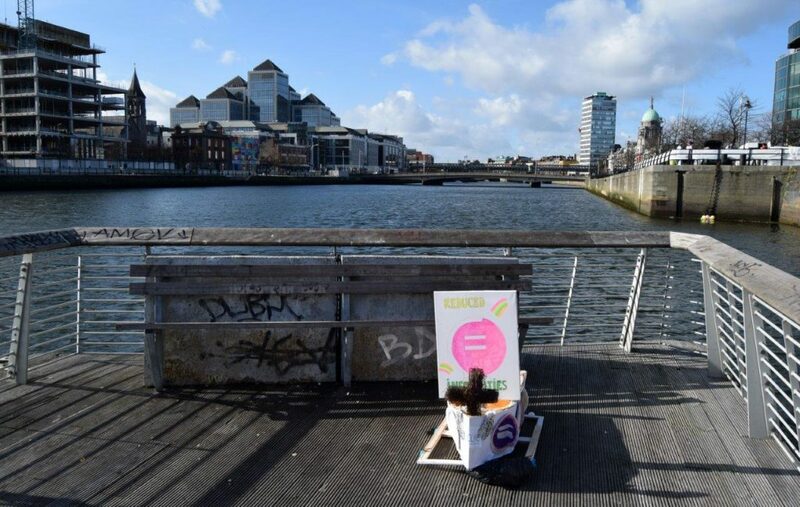 From Deli to Dublin it’s relentless. 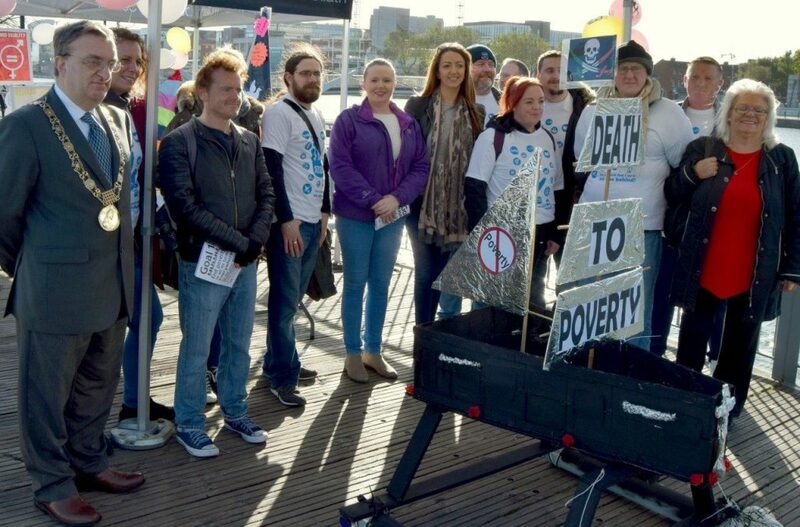 The boat from the Irish National Organisation of the Unemployed is shaped like a coffin to represent the death of poverty and the negative nets symbolise our hope for a world free of the effects of poverty. The nets contain things like death, hunger, depression, hardship, famine and disease all of which can be directly attributed to poverty. 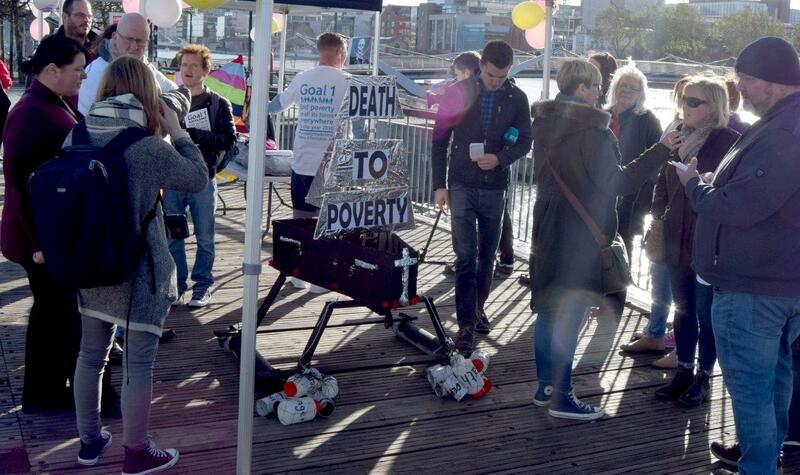 We say death to poverty! Up the flats! Terrence – The cause that I’m speaking for is justice. There is no problem there is only solutions. Love light and peace. 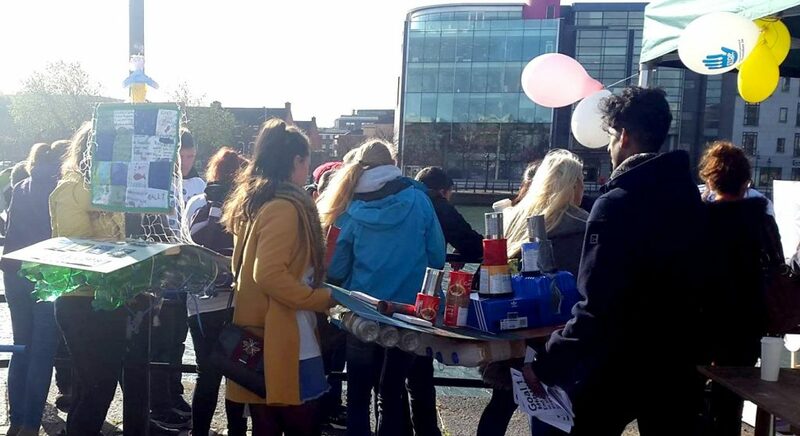 Kayleigh – When we were building our boat with the young people in the Neighbourhood Youth Project 2 we asked them what they hoped for and when talking about ending poverty they went back to the basics such as they said they hoped that everybody, every kid has a pair of shoes to put on. They hoped that every kid could go to school and had a school bag. 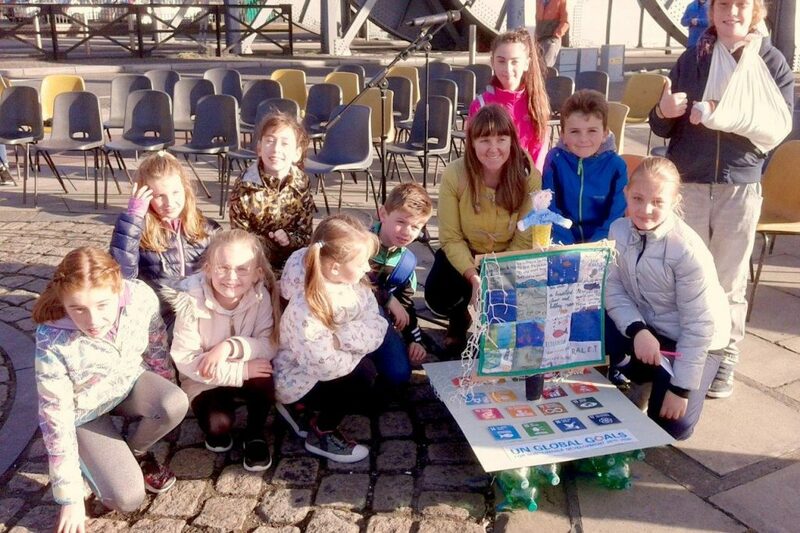 That goes right back to the basics and shows that it’s the small things that add up and we hope that our communities can work together and continue to inspire young people as they inspire us to work together to end poverty. 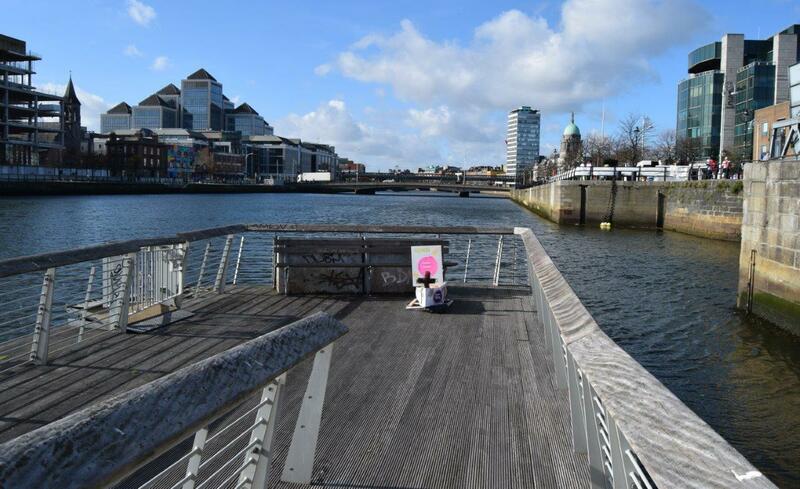 Filipe – I’m representing the Migrants Rights Centre Ireland. 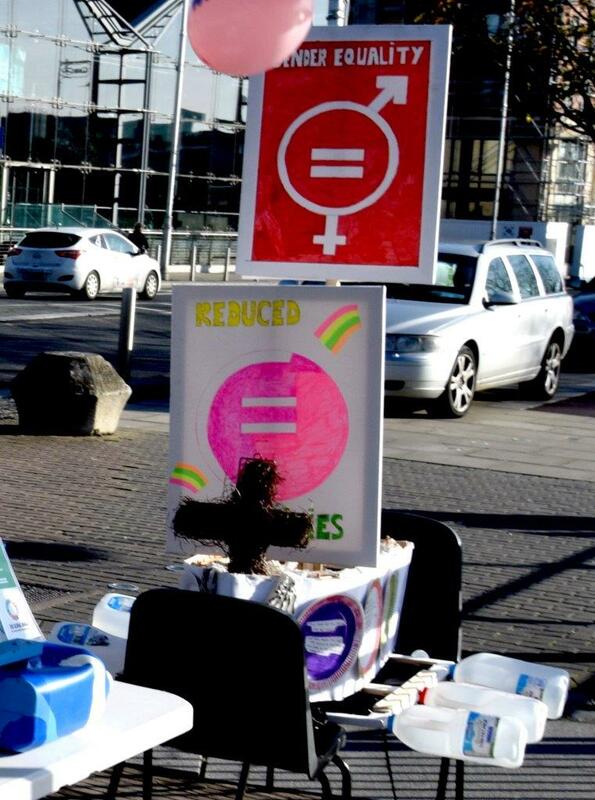 As an Organisation our main goal is to provide empowerment, justice, rights for all migrants that are living in Ireland. 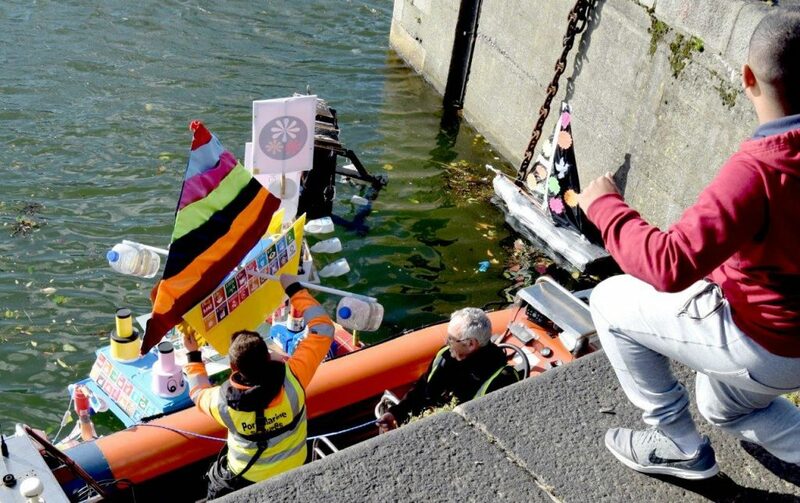 With our boat we would like to express our solidarity with all people who are experiencing social exclusion mainly migrants, undocumented migrants and fishermen. 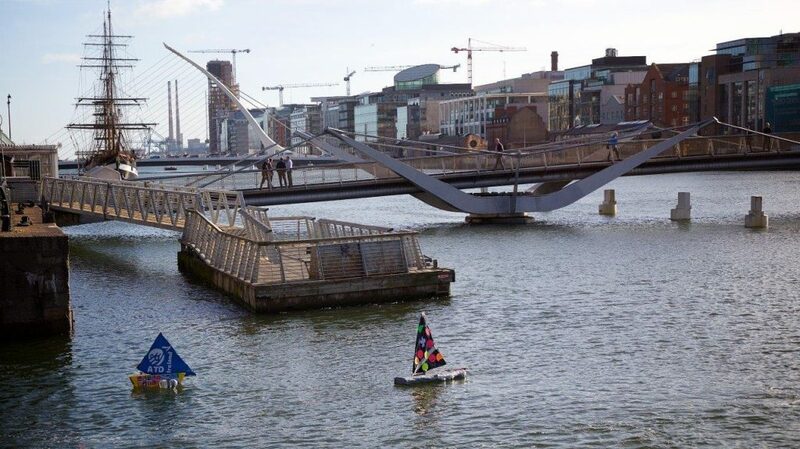 We wish to express and create pathways out of poverty in Ireland and throughout the whole world. 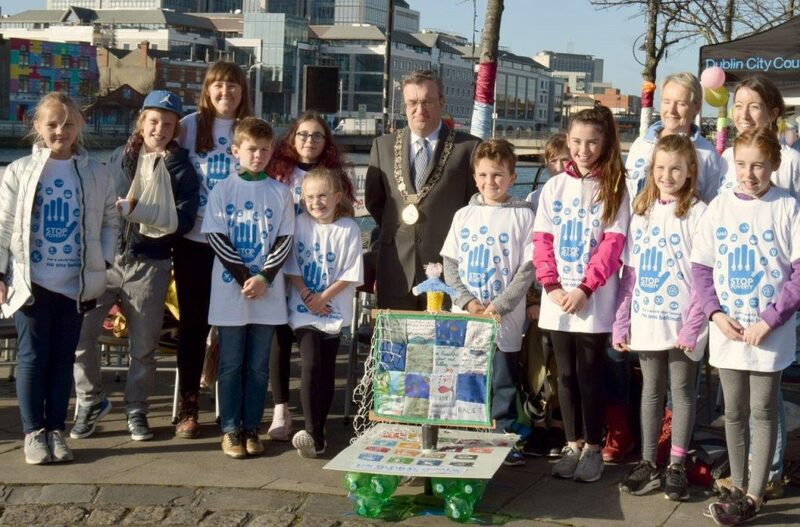 The INTO Global Citizenship Schools Network and the Irish 17 October Committee are grateful to all the participants! 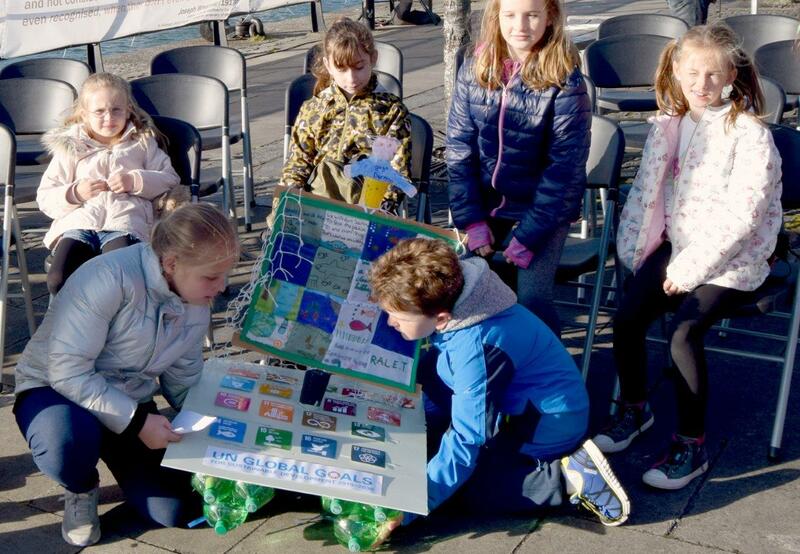 In November 2017 it will contact whole the schools who couldn’t join the event on 17 October 2017 and discuss with them ways to value and promote the work they have done locally to join the campaign! 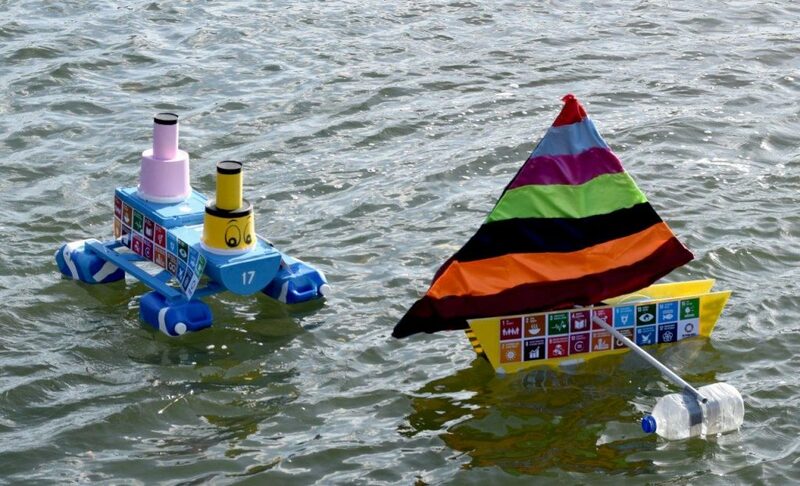 Details here: The 17 Global Goals Boats Group Activity Kit! We have been working really hard to build our boat. 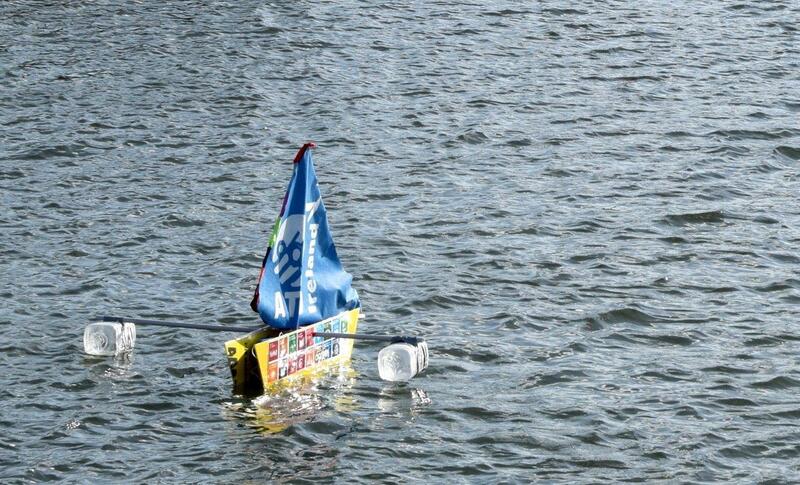 Our boat represents Goal 6 clean water and sanitation and Goal 14,life under water. All our class have written down their hopes and wises on patches and we have sown them together to make a sail. there’s a lot of places in the city that are here to help drug addicts and people in recovery. they went back to the basics such as they said they hoped that everybody, every kid has a pair of shoes to put on. They hoped that every kid could go to school and had a school bag. and continue to inspire young people as they inspire us to work together to end poverty. 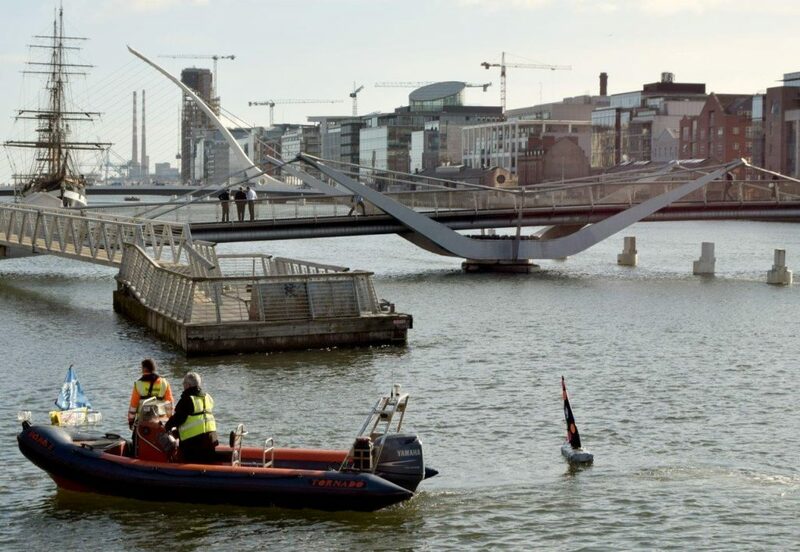 who are experiencing social exclusion mainly migrants, undocumented migrants and fishermen. 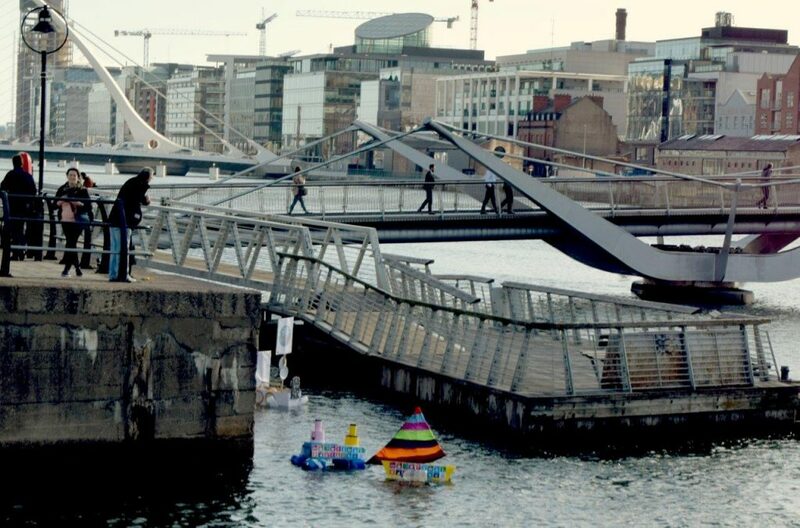 We wish to express and create pathways out of poverty in Ireland and throughout the whole world. 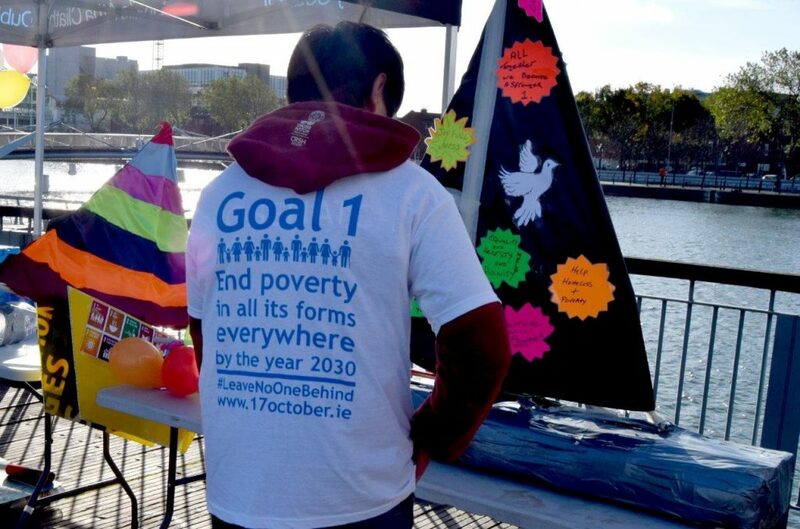 the negative nets symbolise our hope for a world free of the effects of poverty. all of which can be directly attributed to poverty. 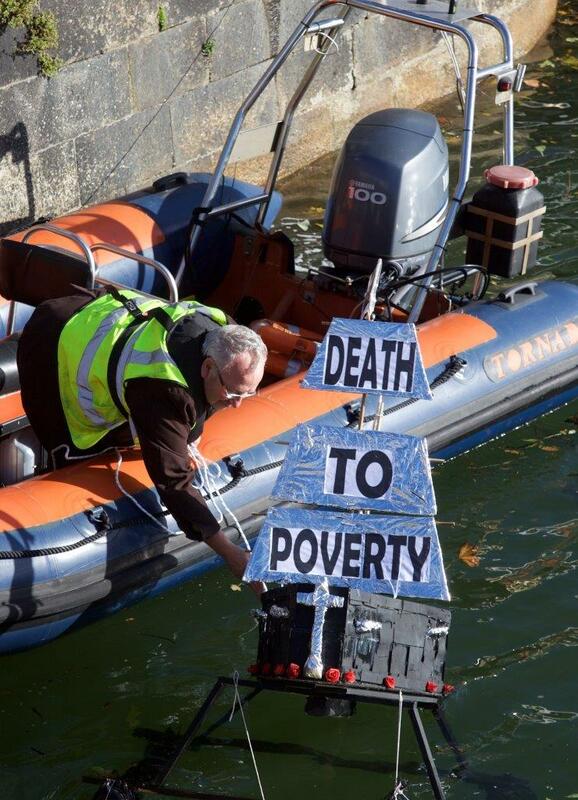 We say death to poverty! Up the flats! North West Inner City Training and Development Programme. 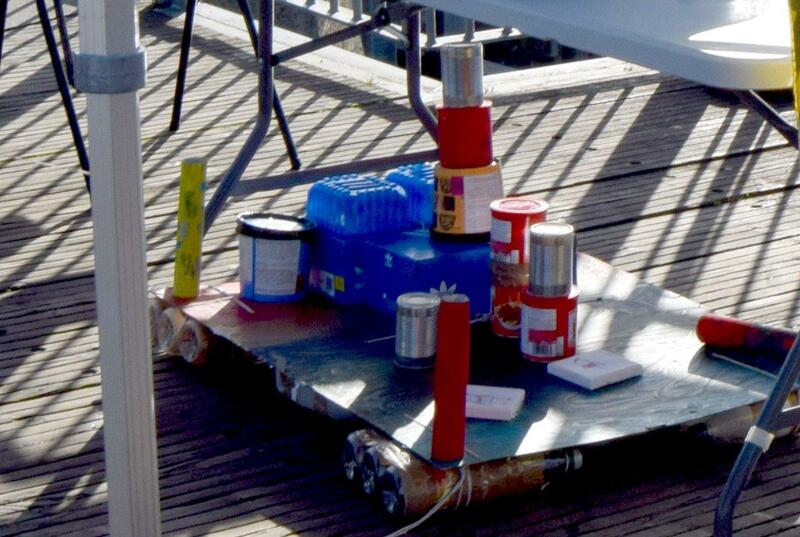 so we just wrapped something up in plastic and hopefully it floats. 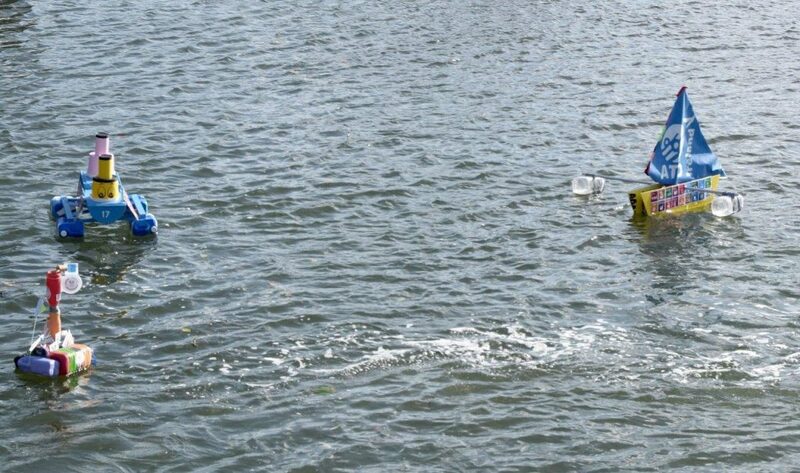 A boat is about life under water, life started under water and everybody needs water. It gives food and employment to millions. The colorful rainbow boat is about justice. There is no problem there is only solutions. Love, light and peace! 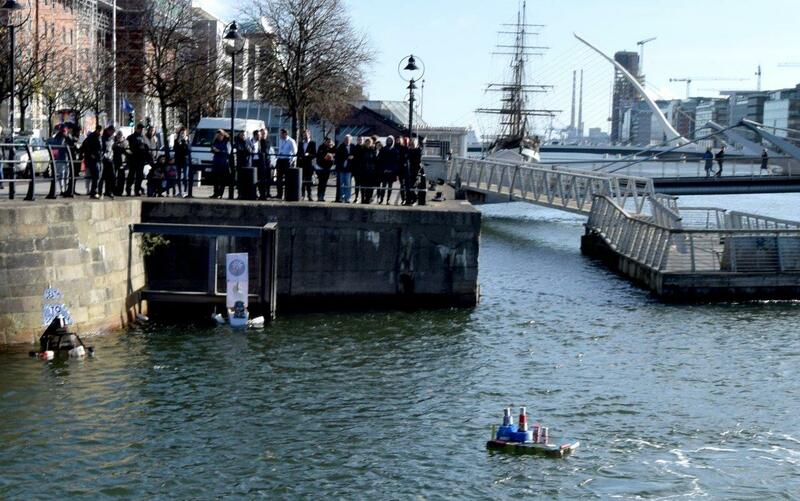 the Global Goals Boats with a 17 seconds countdown! 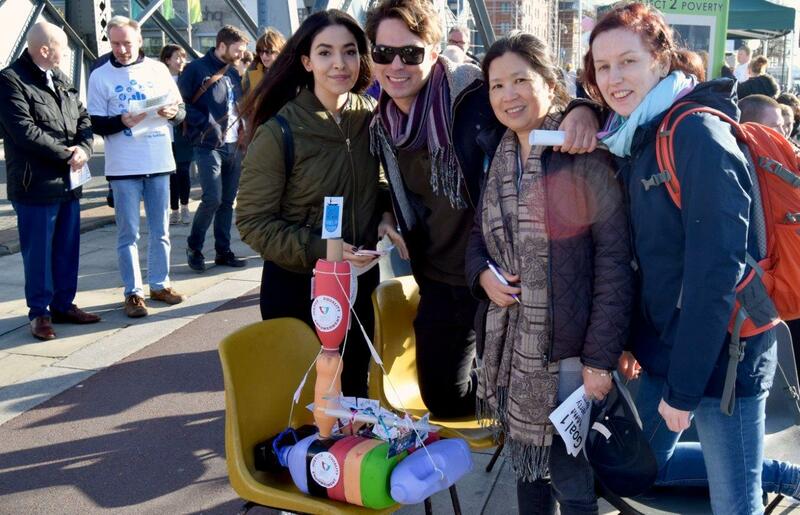 to draw attention to the need to end poverty but also to the Global Goals. and planned by so many groups around the country. that we are all setting out to achieve those goals worldwide. and I’m confident that with that spirit we will get the goals achieved. 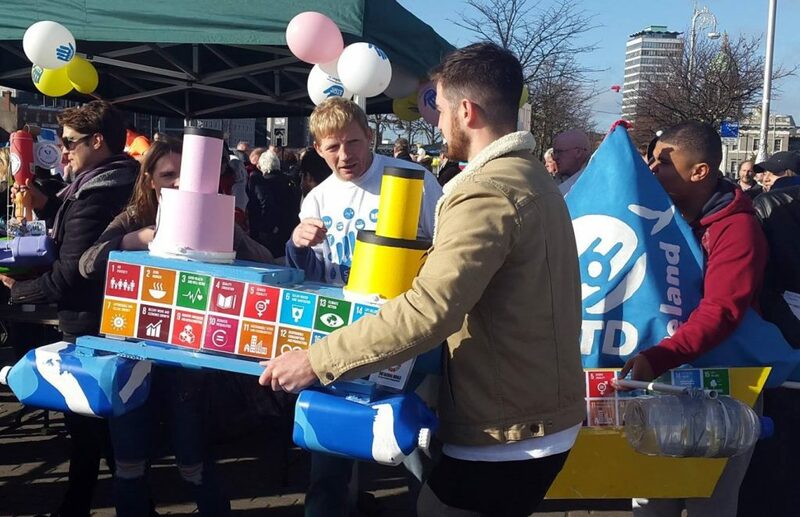 ← Young people’s voices on the 2030 Agenda to End Poverty! 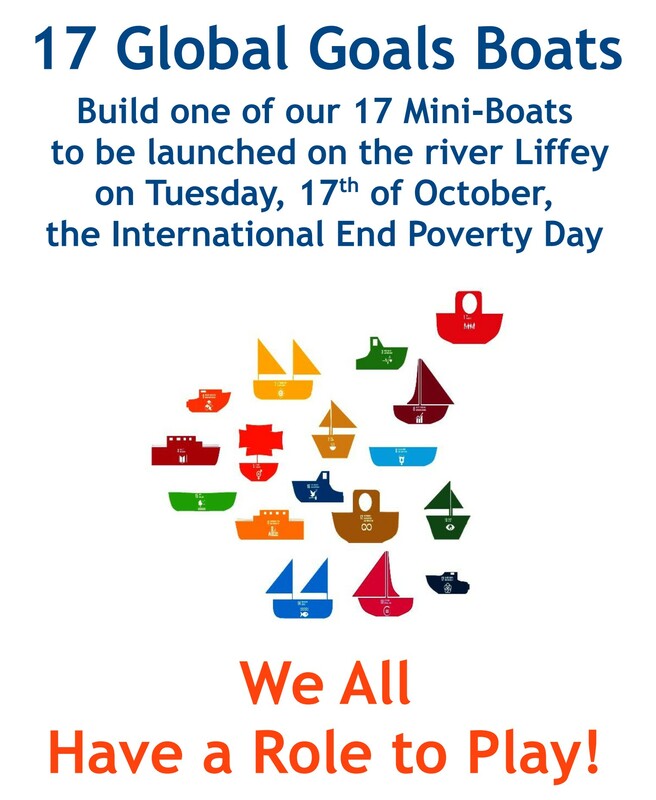 Cork marks the UN End Poverty Day!